Chilies are a member of the capsicum family; I love chilies, my life would be incomplete without them. Luckily my whole household has been conditioned to accept spicy foods from a young age. I can say: “what a relief”. There are many varieties around, all distinguished by shape and by the grade of heat on a scale measured from 1 to 10 where 10 is the hottest. These little crackers are healthy as they have a medley of multi vitamins, they are high in vitamin C, have Vitamins K1, B6, potassium and copper. Not to forget they are also rich in anti- oxidants. Chilies boost anti-bacterial and anti-fungal properties which help fight stomach and intestinal infections and could protect from food poisoning. This recipe is effortless to prepare and contains nothing but the pure ingredient, it comes handy when preparing certain dishes, marinades, in sandwiches and spicy hummus. If you are really a chili addict, check out how easy it is to make my homemade chili oil. * Preheat oven to 100 C / 200 F.
* Cut off the tips of the chilies, deseed and cut long ways. * Place the peppers on a wire rack and bake in the upper shelf of the oven for 3/4 to 1 hour until semi dry. * Leave the peppers to cool on the wire rack. * Remove and pulse to either a smooth paste or a rough paste depending on your use for it. * Store in a glass container in the fridge and consume within a few weeks. 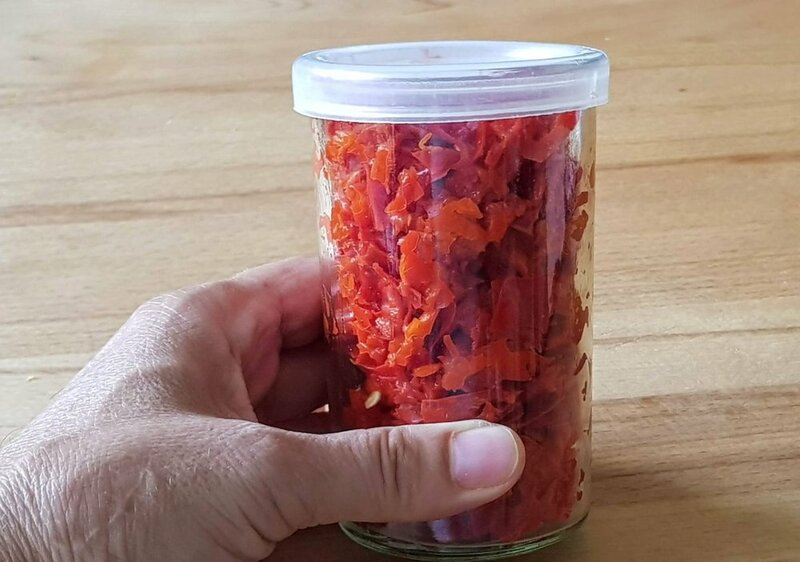 * The peppers used in this recipe are 2 mm thick, if you are using a different variety where the thickness of the skin is greater then you would need to bake it for longer. * You can mix in sweet peppers for a milder heat. * If you would like to preserve it for longer mix some vegetable oil with it and keep in the fridge. Per Serving: 160 Calories; 1g Fat (3.8% calories from fat); 8g Protein; 38g Carbohydrate; 6g Dietary Fiber; 0mg Cholesterol; 28mg Sodium.